Yeh Rishta Revelation Time finally. Kartik, Naira and everyone pray and conduct the Aarti. They wish Kirti to get able to walk and join the Aarti. They pray for Kirti’s complete recovery. Naksh tells them that Kirti is showing good progress. Krish identifies Kirti as his mother and gets calm when she is beside him. Krish holds Kirti’s finger and doesn’t want to go with Naira. Naira takes Krish in her lap. Krish cries and longs for Kirti. Kartik can’t tolerate the sight of Krish’s pain. He feels he is separating a mother and son. He asks Naira to take Krish with her, since he wants to talk to Kirti. He knows Kirti’s state is weak. He fails to tell her about her baby and hugs her. He doesn’t know what she knows and stays in fear. He tries to know if she remembers what he told. Kirti cries and tells him that everyone told her that her baby is no more. He feels guilty. Kartik gets speechless. Kirti reminds Kartik that he told her that Krish is her child. Naksh and Naira worry hearing this statement. Naira rushes to meet the doctor and know the truth. Doctor tells Naira about the high chances, since Kirti will remember the talks she has heard in coma state. He tells Naira that Kirti is stable now and there is nothing to worry. The family thanks that Kirti is fine. They ask Naksh to be with Kirti and not let her be sorrowful. Kartik succeeds to hide the truth. He feels sorry to lie to Kirti. He has chosen to hide the truth just for Naira’s sake. The decision taken in weak moment will cost a lot to Kartik. Kartik then decides to follow the path shown by Krishna and reveal Krish’s truth to Kirti. Naira takes care of the baby and also assists Kirti in babycare too. Naksh and Kirti love Krish. 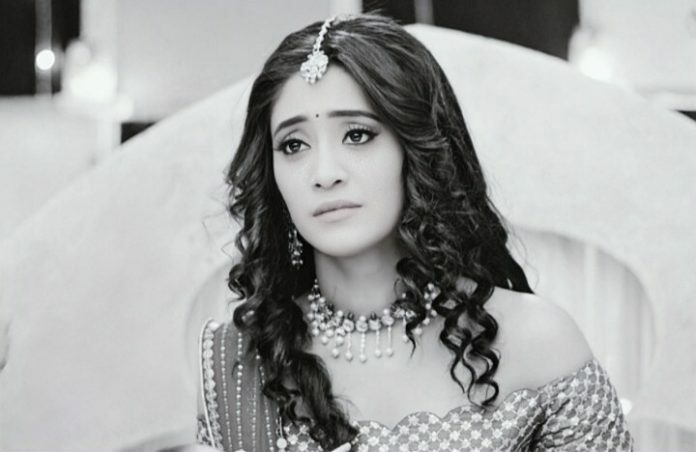 Naira asks Kirti to console Krish. Naira knows Kirti is getting happy and recovering fast because of the positivity brought by Krish. She gives Krish to Kirti every now and then and asks Kirti to handle him so that Kirti stays occupied. Kirti gets happy and back into life for the sake of Krish. Kirti feels motherly love for Krish. Kartik doesn’t want to lie to Naira further. He reveals the truth about Krish. Kirti and Naira confront him for lying to them and cheating them in such a way. They ask Kartik how can he do this with them and mock their motherly emotions. He tries to clarify to the family, but faces a tough time. He wants to explain that Naira and baby needed each other at the time when Kirti was in coma. He justifies his selfish decision and feels guilty. Kartik is much hurt within and explains what he has faced by lying to them. The family doesn’t want to forgive Kartik. Leap in Kumkum Bhagya: Tanu tries to manipulate Pragya against Abhi, but she doesn’t believe her. Aaliya and Tanu meet King at a mall with Chachi. Aaliya tells King that it is good for you that Pragya shall love you, but the truth is that Pragya loves my brother since she was my brother’s wife. King is shocked. Pragya and Abhi are also at the mall. Pragya asks him to marry her. Abhi says we will marry later, first we shall get out from here. Pragya says no, anything can happen to us. She tells him that she wants to marry him now itself. Just then goon shouts asking them to stop. Kumkum Bhagya is taking the generation leap and will focus on Kiara post leap.